In the dry cleaning industry, Ray Kroner said you’re only as good as your previous day’s work. “I wake up every day and think, ‘OK, we have a chance to do it better today,’” he said. The constant pursuit of detailed-oriented results and a commitment to quality are reasons Kroner Dry Cleaners, 3820 North Bend Road, has been able to stay in business for three quarters of a century. The family business is celebrating its 75th anniversary this year. Kroner, the president and third-generation owner of the company, said it’s the oldest single-family owned dry cleaner in Cincinnati. “My grandfather, Lou Kroner Sr., started the business in 1939 and my dad (Lou Kroner Jr.) came on in the early 1940s,” he said. When his grandfather and father first started, Kroner said the business focused on serving the Cheviot and Westwood neighborhoods, but over the years their pickup and delivery service has allowed them to expand and include communities like Green Township, Cleves, Clifton, Colerain Township, College Hill, Covedale and Delhi Township. He said their delivery and pickup services are also now quite successful serving offices and condominiums in downtown Cincinnati. 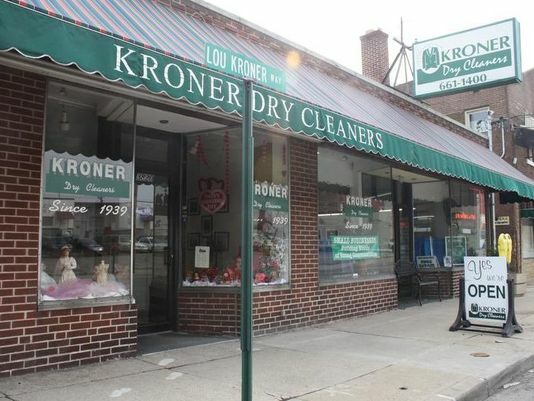 Kroner Dry Cleaners employed six people when Kroner joined the business in 1978, and he said they now have 20 employees, many of whom have been with the company for several years. Lou Kroner Jr. worked for the family business up until his death in March 2012; Ray Kroner’s sister, Mary, worked there for 14 years before opening her own restaurant in Northside two years ago, and his aunt worked as the bookkeeper for 62 years before retiring at age 89. Kroner said his daughter, Emily, now manages the books. In addition to a staff trained to look for missing buttons and make minor alterations to repair clothing items, Kroner said they also utilize the latest dry cleaning technologies. The business recently bought a cleaning system developed in Germany that is both environmentally friendly and tough on stains, Kroner said. The mix of old world hands-on care and modern technology has helped keep customers returning for generations. Kroner hosted a customer appreciation day at The Public House in Cheviot Feb. 1 to celebrate the anniversary and show his company’s gratitude to its customers. He said close to 250 people attended the party. “It was a good opportunity to thank people for the part they play as loyal customers in keeping us going,” he said. He can’t speak for his grandfather or father on whether they envisioned the business lasting 75 years, but he said he suspects they may have. He said he sits down frequently with his staff and talks with them about how quality and attention to details keep them in business. “We want people to come to us because we’re good, not because we’re the last man standing,” Kroner said. At Kroner, change is constant: Processes new, care timeless. Saturday: 7:30 a.m. – 3:00 p.m.
Monday – Friday: 7:00 a.m. – 6:00 p.m.
FREE pick-up and delivery to most of the Westside and downtown business areas. Please call 513.661-1400 for details. Kroner Dry Cleaners voted "Reader's Choice Best of City", Cincinnati Magazine 2012.